Smoky Lake Visitor Centre next to Pumpkin Park, 1555 West Railway Drive, 780-656-3674. Open summer. Looking for a fun daytrip into Alberta's countryside? 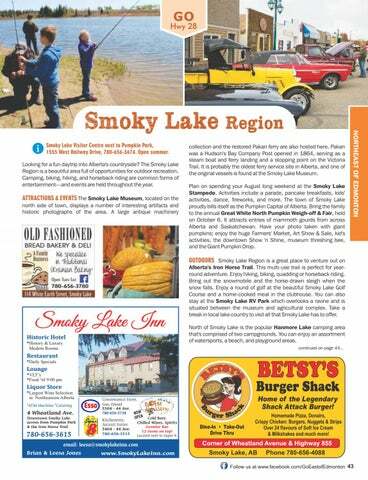 The Smoky Lake Region is a beautiful area full of opportunities for outdoor recreation. Camping, biking, hiking, and horseback riding are common forms of entertainment—and events are held throughout the year. collection and the restored Pakan ferry are also hosted here. Pakan was a Hudson's Bay Company Post opened in 1864, serving as a steam boat and ferry landing and a stopping point on the Victoria Trail. It is probably the oldest ferry service site in Alberta, and one of the original vessels is found at the Smoky Lake Museum. Plan on spending your August long weekend at the Smoky Lake Stampede. 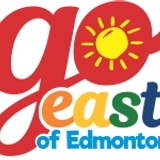 Activities include a parade, pancake breakfasts, kids' activities, dance, fireworks, and more. The town of Smoky Lake proudly bills itself as the Pumpkin Capital of Alberta. Bring the family to the annual Great White North Pumpkin Weigh-off & Fair, held on October 6. It attracts entries of mammoth gourds from across Alberta and Saskatchewan. Have your photo taken with giant pumpkins; enjoy the huge Farmers' Market, Art Show & Sale, kid's activities, the downtown Show 'n Shine, museum threshing bee, and the Giant Pumpkin Drop. OPEN Cold Beer, Chilled Wines, Spirits Growler Bar 12 items on tap! Located next to Super 8. Home of the Legendary Shack Attack Burger! Homemade Pizza, Donairs, Crispy Chicken: Burgers, Nuggets & Strips Over 24 flavours of Soft Ice Cream & Milkshakes and much more!